Pressure Washing: In all of its glorious splendor of the sunshine and refreshing dips in the pool, Summer also brings with it the downside of moisture, mildew and a stark reminder that it’s time to pressure wash. A good pressure washing at the beginning of summer eliminates months of buildup, residue, dirt, and grime that find their way into the exterior walls, ground surfaces, roof, and paint. Professional pressure washing addresses these issues at their source - preventing lots of potential future issues. Siding Replacement: Even with regular pressure washing, sealing, and maintenance, your home’s siding can break down and needs replacement. 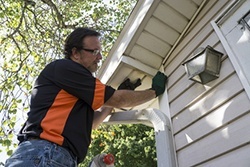 Weather, wear and tear, and just general use understandably take their toll on your home’s siding, and there’s no better time than Summer to take a good look at your siding and determine what needs to be replaced. Drain your Water Heater: Regularly draining your water heater not only prolongs the life of your tank but also increases the ability of your water heater to heat up water to the right level. Draining your water heater gets rid of built-up sediment and decreases the amount of heat transfer needed to reach the heat exchanger. Prepare for Winter: Preparing your plumbing, walls, roof and any other home improvement project for winter is best done in Summer. Regardless of where you live, the damage caused by winter freezes wreak havoc not only on your plumbing, wiring or structures but also on your bank account - in the form of repair costs that you could have prevented by performing Summer maintenance. Break ground on your home improvement projects this summer and enjoy your peace of mind for the rest of the year!